Without rules any product with just a tiny amount of beef in it could be unfairly called “Beef Dog Food”. The first rule requires that at least 95% of a product’s pre-cooking weight must come from the named animal source. For example, in order for any product to be called “Chicken for Dogs” at least 95% of its ingredients must come from chicken. And that’s before it’s cooked… not counting any added water. OK, so how does the 95% Rule deal with a product made with two meat ingredients… say beef and liver? Well, to answer that question, you must first understand how the agency looks at “lists”. The FDA always requires that whenever a product lists its ingredients all must be listed in order of their pre-cooking weight. And that same rule also applies to a product’s name. So, when the name of a dog food includes two (or more) animal ingredients, the predominant one must be named first. And together they must make-up at least 95% of the product. For example, when you see the name “Beef and Liver Dog Food”… you know the two named meats (beef and liver) total at least 95% of the product… and you know beef is the predominant ingredient… not liver. Now, one more thing… When one of the two components happens to be a non-animal ingredient (like a grain or a vegetable) it cannot be used to meet the 95% requirement. In other words, “Lamb and Rice Dog Food” must contain at least 95% lamb. 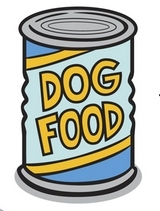 By the way, nearly all “95% Rule” dog foods are canned products. Now, if the named ingredients make up at least 25% of the product (not counting added water)… but less than 95%… the 25% “Dinner” Rule applies. For example, if you see a name like “Salmon Formula for Dogs” you know that at least one fourth of the product comes from salmon. But watch out… Since a name like “Beef Dinner for Dogs” only requires that a fourth of the product be beef, the meat component may actually occupy the third or fourth position on the ingredients list. And that means the first ingredient (the main one) can sometimes be one you don’t really want. Let’s say corn happens to be the first ingredient on the list. And what if your dog was allergic to corn? Well, the name “Beef Dinner for Dogs” makes no mention of the actual majority component… in this case, corn. So, your dog might be in serious trouble. Remember… always check the ingredients list to get a clearer picture of what you’re buying. If two ingredients are included in the name they must together total 25%… so long as neither accounts for less than 3%. Now, unlike with the 95% Rule, this regulation allows the manufacturer to include both the animal and non-animal ingredients together in the 25% total. That brings us to the third naming rule… the 3% Rule… or “With Rule” as it is more commonly known. Whenever you see the word “with” mentioned in a dog food’s name, you’re dealing with an ingredient totaling not less than 3%. Take a look at these two names: “Tuna Dog Food” and “Dog Food with Tuna”. To the unsuspecting shopper, these two dog foods look pretty much the same. Don’t they? But “Tuna Dog Food” contains at least 95% tuna whereas “Dog Food with Tuna” has only 3%. One product contains over 30 times as much tuna as the other. Big difference… wouldn’t you say? Finally, the “Flavor Rule” permits a dog food name to include any specific meat… fish, lamb, chicken, and so on… even if there isn’t a speck of that meat in the product… as long as the word “flavor” is used with it. For example, a dog food can be legally named “Beef Flavor Dog Food” even if the product contains no measurable amount of beef. The only requirement is that a barely perceptible “flavor” must be detectable by a specially-trained testing animal. Wow! You know how sometimes you read something… and you just can’t believe that what you’ve just read? Well, I think it’s fair to say that any product named using one of these last two FDA regulations… the 3% Rule and the Flavor Rule… would probably never qualify as a “high meat protein” dog food.